We’d love your help. Let us know what’s wrong with this preview of Only One Thing Can Save Us by Thomas Geoghegan. Is labor’s day over or is labor the only real answer for our time? In his new book, National Book Critics Circle Award finalist and labor lawyer Thomas Geoghegan argues that even as organized labor seems to be crumbling, a revived—but different—labor movement is the only way to stabilize the economy and save the middle class. But the inequality now reshaping the country goes beyond money and income: the places we work have become ever more rigid hierarchies. Geoghegan makes his argument for labor with stories, sometimes humorous but more often chilling, about the problems working people like his own clients—from cabdrivers to schoolteachers—now face, increasingly powerless in our union-free economy. He explains why a new kind of labor movement (and not just more higher education) is the real program the Democrats should push—not just to save the middle class from bankruptcy but to revive Keynes’s original and sometimes forgotten ideas for getting the rich to invest and reducing our balance of trade, and to promote John Dewey’s vision of a “democratic way of life,” one that would start in the schools and continue in our places of work. A “public policy” book that is compulsively readable, Only One Thing Can Save Us is vintage Geoghegan, blending acerbic, witty commentary with unparalleled insight into the real dynamics (and human experience) of working in America today. To ask other readers questions about Only One Thing Can Save Us, please sign up. Is the title too apocalyptic? Maybe so, but it’s worth it. Especially because it contains friendly, chatty, easy-to-read directions about how to avoid the apocalypse. Geoghegan shows how organized labor is essential to a functioning economy. Capital has the money; people have the numbers. But they need to organize to level the playing field and get their fair share. American labor unions aren’t perfect and Geoghegan criticizes them as only an old friend can. But unions do plenty right, and if we d Is the title too apocalyptic? Maybe so, but it’s worth it. Especially because it contains friendly, chatty, easy-to-read directions about how to avoid the apocalypse. American labor unions aren’t perfect and Geoghegan criticizes them as only an old friend can. But unions do plenty right, and if we don’t help then we’re all going down together. Please read this in your book group. Collective action can’t be done alone. I love Thomas Geoghegan (his Which Side Are You On? is one of the books that has most knocked my socks off), and in my case, this book was certainly preaching to the choir in terms of politics. But it gave me new things to think about in terms of how to go about achieving these goals, so that pushes it past 4 stars for me. It helped that he lives and works in Chicago, so many of his examples were local for me. Leftists praise Geoghegan for thinking out of the box when it involves shaking up organized labor’s establishment, but they get uneasy and defensive when Geoghegan’s outside-of-the-box thinking challenges long-held leftist tenets. To say that organized labor is on the decline is obvious. But Geoghegan’s leftist critics should also acknowledge that the Labor’s Left too, has been in steady decline. Geoghegan’s book demands more serious consideration and engagement from his leftist critics. Geoghega Leftists praise Geoghegan for thinking out of the box when it involves shaking up organized labor’s establishment, but they get uneasy and defensive when Geoghegan’s outside-of-the-box thinking challenges long-held leftist tenets. To say that organized labor is on the decline is obvious. But Geoghegan’s leftist critics should also acknowledge that the Labor’s Left too, has been in steady decline. Geoghegan’s book demands more serious consideration and engagement from his leftist critics. Geoghegan’s two arguments here that stir up the most controversy are (1) With so-called “right-to-work laws” steadily on the march through the states, unions’ days of exclusive representation are numbered, so the labor movement might as well start developing alternative strategies to deal with this reality: namely, organizing and bargaining for workplaces with a minority-union membership, and (2) American unions should adapt the practice of “works councils” of its European peers, whereby workers get elected to sit alongside management and have voting power over the decisions that effect the workforce. Just as we can anticipate traditional unionists protesting Geoghegan’s book (“what! Give up exclusive representation? Why, that’s the backbone of the unionism! ), so can we anticipate leftists responding “What! Have workers sit on a works council! Why, that goes against everything we stand for!”). Geoghegan is quick to provoke both labor’s establishment and labor’s left. As a socialist in the labor movement, I’m not sure if Geoghegan is right either, but I think his ideas need to be taken seriously and merit thoughtful critiques. 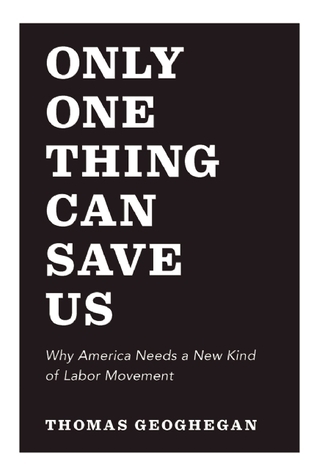 Only One Thing Can Save Us was reviewed in about as many outlets as we can expect for a book about the labor movement. The most substantial critique I read was Chris Maisano’s in Jacobin (jacobinmag.com/2015/01/bringing-labor...). Maisano may very well be correct in his positions, but he does not always sufficiently prove how. I would love to attend a debate between the two, or read a longer-form response from Maisano, whereby he could further elaborate his points. It is not contradictory to acknowledge the guise of the Japanese auto strategies and at the same time entertain Geoghegan’s proposal of works councils. The risk of workers identifying with the interests with the company is certainly real. But I have enough faith in workers that I’m not yet convinced that their participation on works councils automatically means their co-optation and subsequent abandonment of their class consciousness. Geoghegan’s book should prompt an earnest exploration of how works councils could advance workers’ interests in the American context. I don’t know enough about how the German model has functioned in practice, but we can certainly observe the results of the power of German unionism—a significantly higher level of organization and a higher standard of living for the German working class. Works councils in transnational corporations have the potential to transcend national labor movements. Maisano and other critics haven’t paid attention to Geoghegan’s point that federating works councils across countries could form an international works council, something that should catch the attention of socialists. It also feels unfair when Maisano brushes aside Geoghegan’s concern over American debt to foreign creditors. Again, I don’t know much on this subject, but Maisano seems rash when saying that it implies some kind of zenophobia. That’s like saying resisting the movement of jobs to China is xenophobic because it is against job growth for the Chinese. Maisano very well may have a strong economic argument for his disagreement with Geoghegan, and he may very well be right. But he should bother to actually make the argument. Maisano and most of us who identify as socialists in the labor movement keep our faith in the primary power of worker self-activity and direct actions like the strike. But we mustn’t feel threatened by and act reactively to calls for experimentation with new strategies. This is one of those books that really altered my perspective--it's good to find at least one book like that a year. I highly recommend. It is easy to read and really gives you a good grasp of the history and economics behind his argument. This is a pro-union book. I found its depictions of the Chicago Teachers Union interesting and I like the idea of changing the rules so unions could go into places and unionize workers who want to join without requiring a majority vote so everyone is represented. Georgetown shows how revived and transformed labor movement is vital for America's future economy, democracy, and for a decent society. Solidarity forever!